This winter, you might find yourself in need of a propane heater. These devices use propane to produce heat that will fill a small area, but because of the gas usage, they need to be ventilated. There are a huge number of these products, but we’ve made this propane heater buying guide to help you choose the perfect one for your space. But before we get started, let’s take a look at some things you should know before you start shopping. Type: There are a few types of heaters. 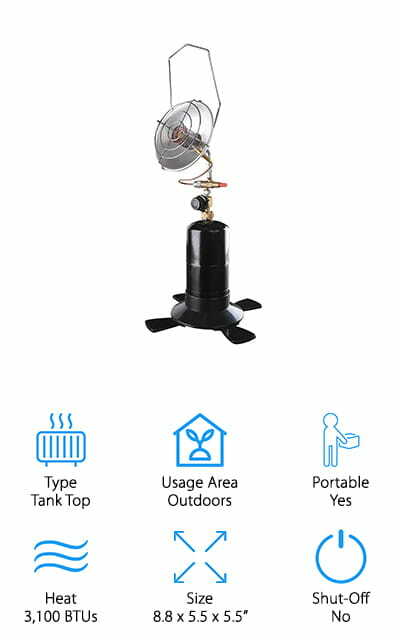 Patio heaters are large stands that heat outdoor areas, cabinet heaters are smaller units, tank top heaters screw to the top of the tank and forced-air heaters include a fan. 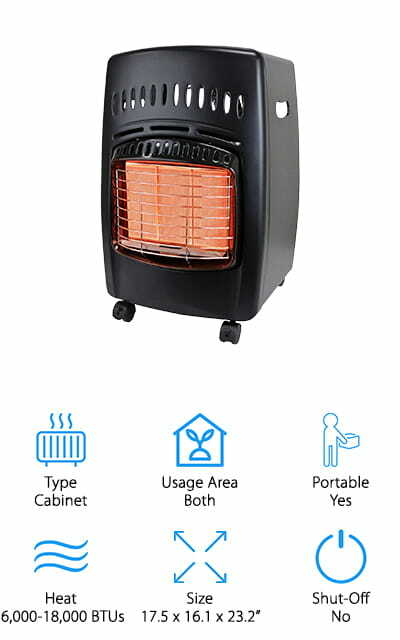 Usage Area: Can you use this heater indoors, or is it only good for outdoor use? Some are okay for use both indoors and outdoors, while others can’t be brought inside because they need more ventilation. Portable: Some heaters can be moved around fairly easily – some have wheels or stands where you can put the propane tank if you’re planning on being on the move. Make sure it’s easy to move it around if you need to. Heat: This is the amount of heat created, measured in BTUs. This means British Thermal Unit, and it’s a measurement of how many square feet it will heat at different levels. 20,000 BTUs will heat 600 square feet, for example. Size: How big is the unit? You’re going to want a unit that will fit without being in contact with anything for safety reasons. So get a heater that’s small enough to fit in an open space. Tip Over Shut-Off: This is a feature that will detect when the heater has tipped over and will promptly shut it off so it doesn’t cause any fires. It’s one of the great safety features that you’re going to want on your heater. Now that you know what to look for, let’s take a look at some heaters! We’ve compiled our propane heater reviews from lots of research and review, in order to bring you a selection of the best! Take a look at our top pick and budget pick first, as they will show you the best of the best! Afterward, peruse the rest of our list for a wider variety of great heaters. Find your new winter solution now! Our pick for one of the best propane heaters for sale right now is the Dyna Glo Cabinet Heater. It has adjustable heat settings that range between 6,000 BTUs and 18,000 BTUs, which is pretty amazing considering its size. At the highest setting, this heater will heat up to 450 square feet of space, both indoors and outdoors. It’s great for workshops and decks, and it’s portable enough for camping. It has an ODS sensor, which keeps track of the oxygen levels and shuts it off if they drop below a level that is considered safe. Because of safety features like that, this is considered to be the best indoor propane heater on our list. There are two locking wheels under the unit so you can push it around where you need it within your space. It uses a 20-pound propane tank and has a self-contained cylinder on-board. And it’s easy to start as well, with a push-button ignition! This cabinet unit by Mr. Heater has a fold-down handle that allows you to store the heater in a variety of places when it isn’t in use. There are two heat settings – the low setting is 4,000 BTUs and the highest setting is 9,000 BTUs. There’s a wire guard around the large heating surface to make sure that the unit doesn’t overheat. It also has a low-oxygen safety shut-off and a tip-over safety shut-off. 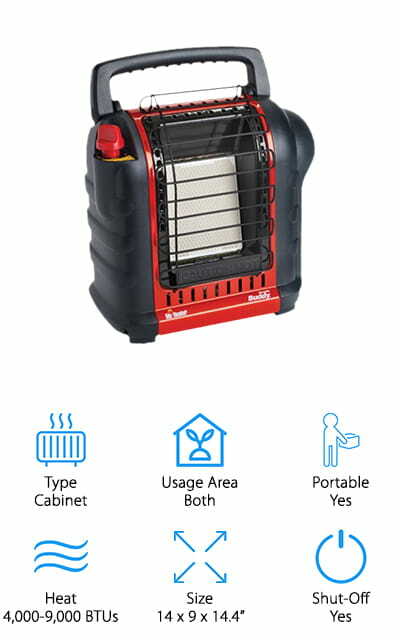 It’s on one of the best cheap propane heaters, and the ability to use it indoors and outdoors makes it the best portable propane heater for garage use that we’ve seen in our list. It’s easy to attach the cylinder and hose because the regulator swivels to allow you better access. That’s pretty awesome! The ceramic burner won’t break if this heater happens to fall over when not in use, because it’s insulated to be shock-absorbent. We love all the safety features! 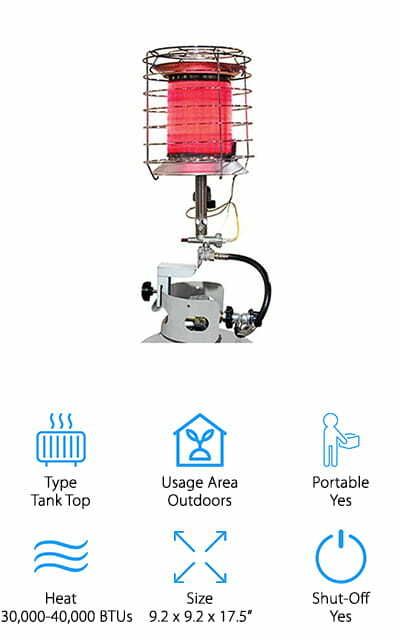 The Texsport Propane Heater is a small camp heater that uses the same technology as a single-person camp stove. 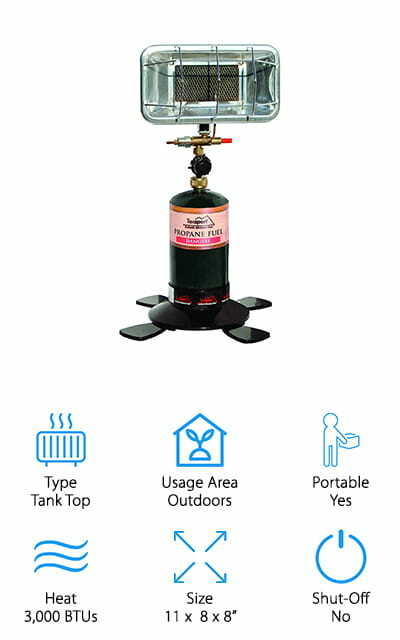 The heater screws onto the top of a propane tank that you can buy at any camping store. It’s a durable stainless steel burner with a pressure regulator. This small heater can put out an amazing 3,000 BTUs of heat! If the flame goes out, the heater itself utilizes an automatic shut off valve so that the fuel won’t continue to run. It is the best portable propane heater on our list – and it’s probably the most portable one, as well! It comes with a molded plastic cup holder to help make your camping experience go smoother, as well as a paddle foot base that holds a standard disposable propane cylinder. We love that this simple little heater puts out so much heat, and it’s great for any outdoor situation! And we love how widely-available the fuel is. The AZ Patio heater is the first patio heater on our list. It uses the 20-pound propane tank that you already have, and it’s easy to install. It will sit in its own little compartment behind an easy access door. When the tank is empty, it is really simple to switch it out! Because the propane tank is on the fixture, you can wheel it around wherever you want without having a lot to move. The wheels make it super easy to move! On the highest setting, this patio heater will last between 8 and 10 hours, so you can be cozy for a long time! The heat output at the highest setting is an incredible 40,000 BTUs, which will heat nearly 1200 square feet. That’s pretty amazing! 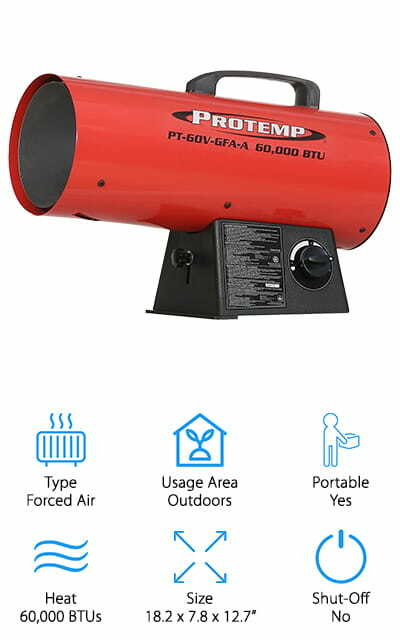 Stay nice and warm during your outdoor events with this amazing heater! It has a classic, beautiful hammered bronze finish that will look great on your porch! We love it! This patio heater from Fire Sense is an amazing heater that puts out an astounding 46,000 BTUs of heat. It’ll heat your entire outdoor area, including the air around your pool! It comes equipped with a Piezo ignition, which is an electric ignition system that sparks the gas with high electrical pressure. It comes with a wheel assembly that includes heavy-duty wheels that can take on any type of patio floor, including rocky areas. That makes it super easy to run around! At full power, one 20-pound tank of propane will last ten full hours, so you can have tons of fun without worrying about replacing the tank. Inside, there are durable stainless steel burners and a double mantle heating grid, which gives this heater the power that you want! It comes with an auto shut-off tilt valve, so it won’t stay on if it starts to fall over or even tilt slightly. It’s a great safety feature! The Dura Heat TT-360 provides all-around heat instantly. This small package can put out up to 40,000 BTUs of heat without breaking a sweat. It heats up to 1,000 square feet of outdoor space, so you can be sure that you’re going to be toasty to matter what the temperature is outside. The heater goes directly on top of a 20-pound propane tank, and operates off that same tank for an amazing 14 hours! It’s great for construction sites, and it is probably the best propane heater for garage use, as long as the garage door is open. Even the largest spaces will stay heated and cozy with this heater! There’s a tip-over shut-off valve that will immediately cut it off if there is any motion detected. The tank can be quickly connected and disconnected without the use of any tools! The heat reflector that makes this heater so effective is made of durable stainless steel. Our first force air heater is an amazingly powerful machine! It produces 60,000 BTUs of heat, which will heat up to 1500 square feet of space outdoors! A 20-pound propane tank will last this little powerhouse up to 11 hours on the highest setting. The variable heat settings work to heat however much you want, no matter what type of site you’re working on! It’s great for barns, garages, workshops, and even outdoor construction sites! There’s a ten-foot hose that you attach to a tank, with a regulator included so you don’t have to buy anything but the propane! The best part about this heater is the enclosure. It’s fully enclosed, so no part of the heating element is exposed. What’s even better, though, is that the enclosure allows you to adjust the height of the unit. You can heat higher areas now, without having to find some way to funnel heat upwards from a floor cabinet! 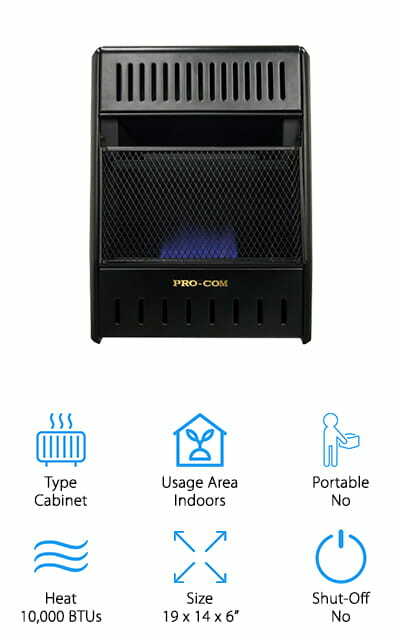 The ProCom Heater is unique on our list because it is the best vented propane heater that we found. You can mount it directly on the wall of your house. It comes with a ten-foot hose so you can connect it to a twenty-pound liquid propane cylinder. It’s the best propane wall heater we ran into, as well as the best propane heater for house use, or use indoors anywhere! It has a manual control that provides variable heat up to 10,000 BTUs, which will heat up to 300 square feet of space. There is no need for an outside duct or chimney, as it doesn’t need the same type of ventilation as some of the other heaters on this list. The ignition is a Piezo electric push-button ignition so you’ll be able to get it started every time without having to light it manually. There’s even an ODS sensor that shuts the unit off if oxygen levels drop. The Stansport Infrared Propane Heater is a tank-top unit that we rate as one of the best outdoor propane heaters that we found in our research. It’s a deluxe model that’s good for any type of outdoor activity, including camping trips on chilly days, fishing, and other sporting events. It produces an amazing 3,100 BTUs of heat, all from a 16.4-ounce disposable propane cylinder. These cylinders can be found just about anywhere. There is a metal dish that focuses heat in a particular direction, as well as four control settings, from off to high, allowing you to customize your heat. There is a carrying handle so you can move it wherever you need it as the day goes on. It’s essential for people or families who enjoy camping and don’t let the cooler temperatures stop them! The rear cage makes it so that you can’t actually touch the heating element, which is a great safety feature. 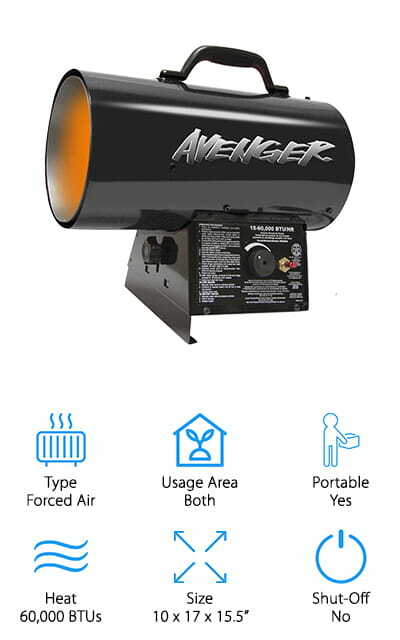 The Avenger Portable Heater is a forced air heater that can stand up to abuse! It’s got a heavy-duty construction that won’t easily be damaged. It’s finished in black powder for added durability. You can adjust the heat angle for convenience, which is great on the job at a construction site or warehouse. It can put out almost 60,000 BTUs. Even the best propane heater for home use doesn’t match that power! It is recommended to use forced air type heaters in vented outdoor spaces, or spaces that are not tightly enclosed. The push-button ignition eliminates the need for a lighter or matches and burns quietly without any further tinkering. The motor is thermally protected, so the constant heat will not affect how the unit works. The variable heat settings allow you to turn it up or down as you see fit, depending on the heat that you need. We love how powerful this little unit is!